Drawing inspiration from the traditional Irish claddagh symbol, this Holding Hands personalized frame's design celebrates the qualities of love (heart), friendship (hands) and loyalty (crown). 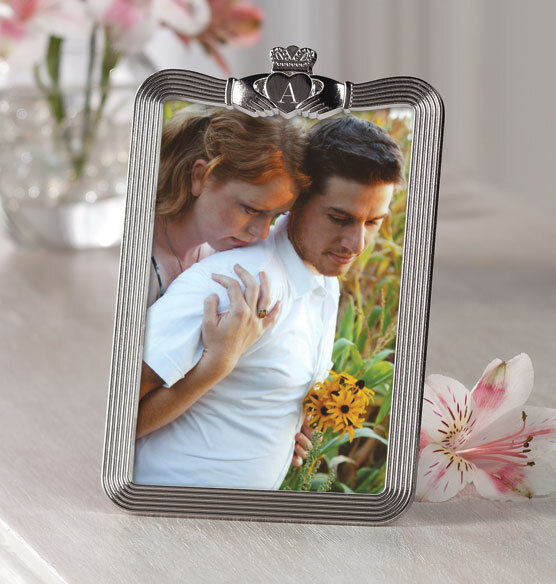 A single initial engraved in the center of the heart makes this frame a perfect sentimental gift for newlyweds, couples celebrating wedding anniversaries and more. BEST ANSWER: Thank you for your question. It measures 4 1/2" wide by 7” high. We hope this information will be of help to you.